Landscape painting in oils steadily became more popular during the 19th century. John Constable and his contemporary J.M.W. Turner take credit for establishing landscape as a significant subject. Until then, history paintings had been considered more important, but increasingly naturalistic paintings of picturesque views of the British landscape appealed to a wider section of the art-buying public. Dr John Fisher, Bishop of Salisbury, commissioned this painting in 1820. He and his family were some of Constable's closest friends and the artist taught one of his daughters. There has been some confusion over the identities of the figures in the painting but they are now thought to be the Bishop and his wife at the gate, and the figure a little further down the path, one of their daughters, probably Dolly. Constable had made a series of sketches before starting work on the canvas, and after it had been exhibited at the Royal Academy in 1823, he was asked to make a smaller version and a full-scale replica. The painting embodies the full range of qualities of a quintessentially British landscape painting - the clouds, trees, a water meadow, cattle drinking at the edge of the pasture and the glorious architecture of a medieval cathedral - but all on a human scale. Paintings like this one have so conditioned our view of rural Britain that it is now difficult to imagine a time when the countryside and country life were not held in such high regard. 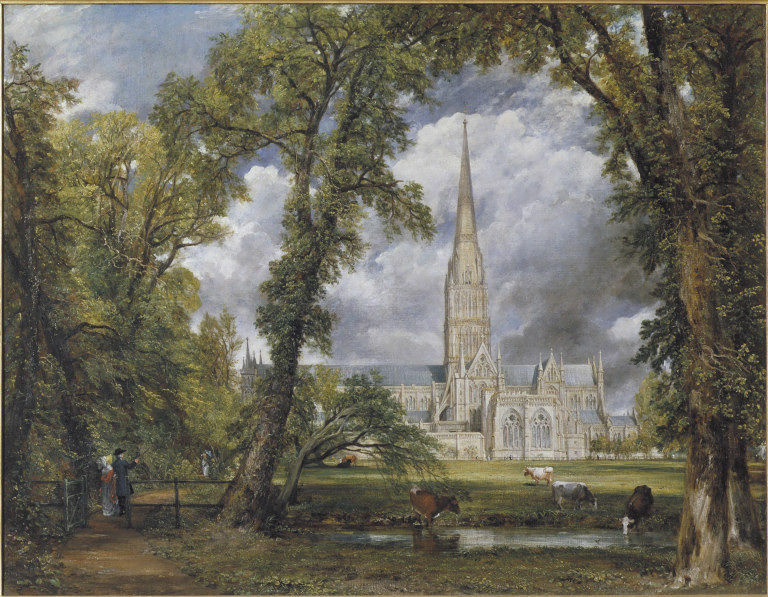 Painting of Salisbury Cathedral from The Bishop's Ground, with cattle, some drinking from a pond, sheltered by tall trees, and with a man and woman walking along a path on the left hand side. Oil on canvas. Signed and inscribed, lower left; the inscription is no longer legible. In 1823 Constable's chief exhibit at the Royal Academy was 'Salisbury Cathedral from the Bishop's Grounds' (No. 254 [FA 33] in this Catalogue). He visited Fisher in August (see Nos. 256 [281-1888] and 257 [354-1888]) and stayed with Sir George Beaumont at Coleorton from the last week of October until the end of November (see Nos. 259-262 [835-1888, 815-1888, 266-1888, 356-1888]). 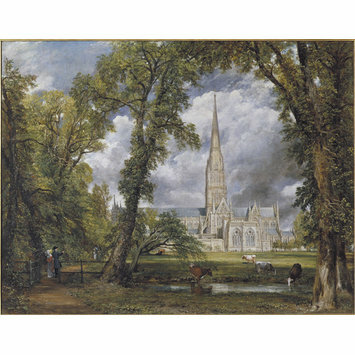 Oil painting by John Constable depicting Salisbury Cathedral in Wiltshire. Great Britain, 1823. Grey, Anne and John Gage Constable. Impressions of Land, Sea and Sky Canberra: National Gallery of Australia, 2006. ISBN: 0642541566. Evans, M., with N. Costaras and C. Richardson, John Constable. Oil Sketches from the Victoria and Albert Museum, London: V&A, 2011, p. 22, fig. 17. Timothy Wilcox, Constable and Salisbury. The Soul of Landscape London: Scala Publishers Ltd, 2011. ISBN: 978 1 85759 678 6.